Congratulations to Mortgage Architects brokers and MA corporate for receiving 13 nominations at the 2015 Canadian Mortgage Awards. 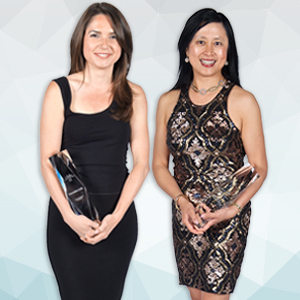 Christine Xu, broker for Mortgage Architects and the MA Marketing team led by Karen Fogel each took home a Canadian Mortgage Award on Friday, May 22, 2015 at The Liberty Grand in Toronto. Christine Xu received the Home Trust Company Award for Alternative Lender Broker of the Year. Congratulations Christine on the recognition you received for being a standout performer in the alternative lending sector! Mortgage Architects’ VP of Marketing and Communications, Karen Fogel took the stage to accept the Kanetix Ltd Award for Best Internet Presence. Thanks to Karen’s strategic vision and direction, MA was recognized for effectively utilizing the internet to “provide consumers with practical, effective and easily accessible tools to understand and prepare for the mortgage process.” Karen thanked her team for their hard work and dedication and elevating MA to where it is today. Congratulations to Christine and the MA Marketing team for being recognized among their peers for their contributions to the mortgage industry. We at MA are proud of your accomplishments.